Laura Crowden, the c word’s ‘Royal Correspondent’ brings us this report from London on the intense media scrutiny around the impending royal nuptials. Union Jack’s are everywhere. Apparently the tulips at Buckingham Palace have bloomed a fortnight too soon. BBC correspondents, even the cameramen, will be in formal dress. The bride has just been given her own coat of arms. Posh and Beck have received their invite. Camilla described it as ‘wicked’. The reason for the hooplah is of course, the upcoming marriage of HRH Prince William and Miss Catherine Middleton. Girl-next-door girlfriend Kate Middleton has been replaced by uber-glamourous fiancée Catherine. And the UK and international media has been there every step of the way since the engagement was announced back in November. Media coverage has been escalating over recent weeks. Kate is likely to grace the front page of at least one daily broadsheet paper daily, with the tabloids devoting saturated coverage to the nuptials. In addition to the newspapers, every television station is devoting almost the entirety of 29 April to covering the Royal Wedding, and international journalists are converging on London. The BBC will deploy at least 550 staff on the day, using about 100 cameras in Westminster Abbey and along the procession route to provide a live feed to dozens of countries and footage to many more. Thankfully, the BBC has confirmed that the Royal Wedding coverage will not be impacted by looming budget cuts, saying it will be given “due prominence… this will be a big-scale event”. About 140 broadcast trucks are expected to set up in Green Park near Buckingham Palace and 48 television studios have been purpose-built nearby for what is thought to be largest outside broadcast ever. The media landscape has shifted considerably since 750 million people tuned into watch William’s parents Charles and Diana get married in 1981. Royal spokespeople have released social media coverage plans for the royal wedding on April 29, and they plan to flood Facebook, Twitter, Flickr, YouTube and the Official Royal Wedding website with the nuptials and pomp and circumstance before and after. 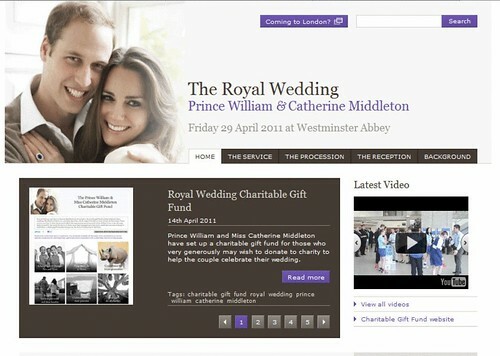 The social media saturation is “in line with the couple’s wishes to make the wedding as accessible as possible for as many people as want to participate,” which Buckingham Palace confirmed through Clarence House, the public relations arm for the big day, on its website. Wills and Kate will be getting married live on YouTube, via the official Royal Channel, and staff at St James Palace and Clarence House will provide regular Twitter updates. Coverage of the wedding ceremony itself will broadcast from 11:00am GMT. The unseasonably warm weather means Britons will be making the most of the extra bank holiday, with local councils giving almost uniform support for local street parties and public events. Combined with the UK’s tolerance for public alcohol consumption, it’s likely to be the social events of the year, even for those without an invitation to the palace. ‘Austerity Britain’ is in need of a party. The ongoing recession, high unemployment and rolling spending cuts (even Prime Minister David Cameron and his multi-millionaire aristocratic wife, in a blatant PR stunt, recently travelled on a budget airline) means Britons have had little excuse in recent years to party. It has been riots, not street parties, rocking London over the past year. And amidst all the fuss, not a single strand of Kate’s perfectly blow-waved mane (courtesy of Richard Ward of Sloane Square) has been out of place. Her blue engagement dress by Issa sold out in hours and has been copied by the high street and even supermarket chain Tesco. Fake ‘Kate’ engagement rings (which is the very ring Prince Charles gave to Diana) are available for £8.99. Every girl, it seems, can be a princess. Her gradual weight loss has been the subject of intense media scrutiny and derision, and every single aspect of her wedding outfit has been speculated and debated. Apparently she will wear her hair out. Apparently she wants flowers in her hair. She will not be arriving by carriage. Her dress is believed to be designed by Sarah Burton of Alexander McQueen. Britain, and particularly London, is in the grip of Royal Wedding Fever. Despite plummeting support for the Royal Family in recent years, there is almost unanimous affection for down-to-earth William and his lovable, larrikin brother Harry. Even ‘Waity Katey’, as Kate was formerly tagged by the tabloids, is seen by the British public as fairly grounded and lovely young woman. She and William have been together for eight years, and the Royal Family has been sure to fully integrate her into royal life to avoid the mistakes made with Diana. Only the most ardent monarchists seem to be complaining about the waste of taxpayers money. By declaring a public holiday (part of the ‘Fabulous Fortnight’ which also includes three other public holidays thanks to Easter and the May bank holiday), the Royals have well and truly got the British public onside. Everyone, it seems, is ready to party. And of course, we are all dying to see what Kate will wear.